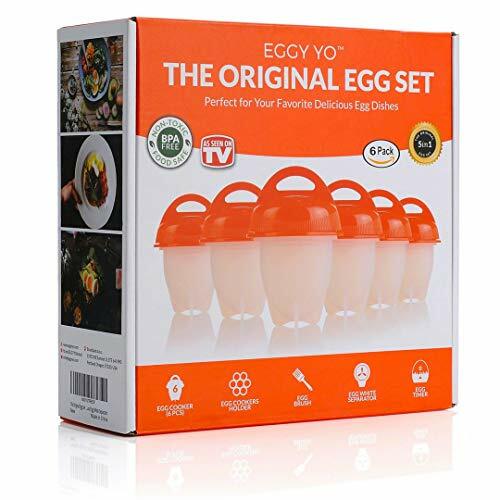 This convenient egg cooker set from EGGY YO makes cooking eggs so simple. As seen on TV, we are the original egg set that allows you to perfectly make hard, medium or soft boiled eggs. 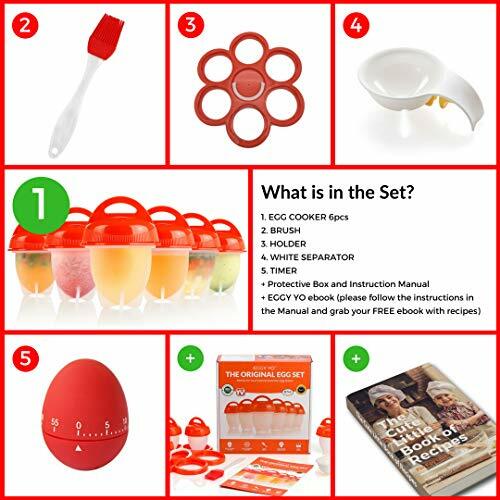 This 5 in 1 set includes 6 egg cups, an egg cup holder, egg white separator, oil brush and egg timer. Our must have kitchen accessory will ensure you can always cook eggs with ease. Make cooking eggs as easy as Crack, Boil and Pop. Use the brush to lightly coat the inside of the egg cup with oil before gently cracking eggs into them and securing the lids to the cups. Next, place the cups in the egg holder and boil in water until cooked to desired style. Carefully remove the holder from the water and place momentarily in cold water before popping cooked eggs out of the cups. 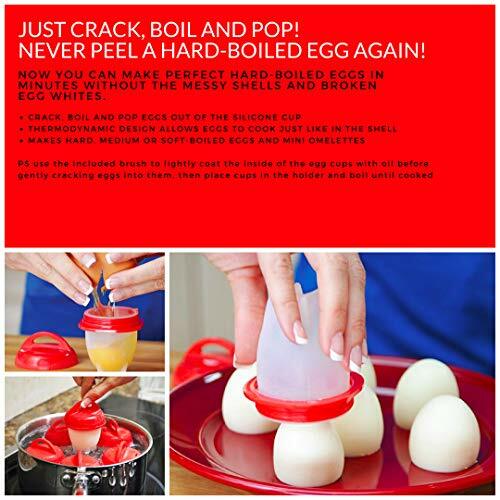 You'll never have to struggle to peel a hard boiled egg again. With our egg steamer set, you won't have to spend precious time peeling eggs over the trash can. Our set is thermodynamically designed to cook eggs exactly as if they were in a shell, so you get perfectly cooked eggs without any difficulty peeling later. Our egg set can be used in a variety of ways. 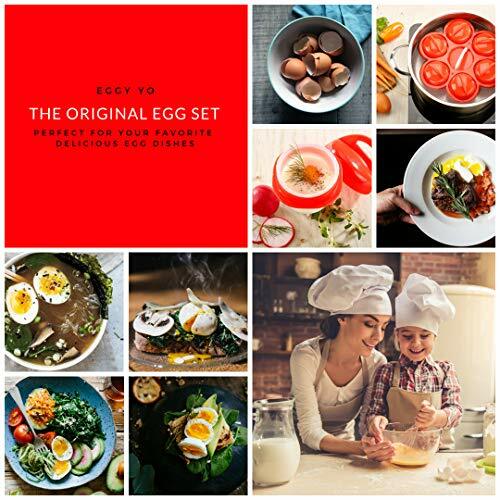 Use the set to cook eggs to perfection, or easily make egg bites or mini omelettes by adding veggies, cooked meat and cheese before eggs are placed in water to boil. 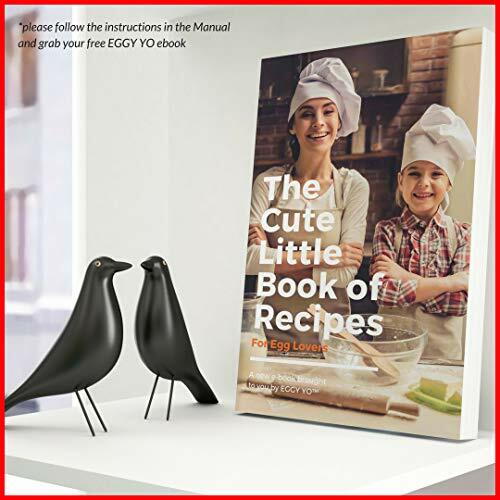 We've also included a bonus ebook that features recipes and detailed instructions to help you make delicious egg dishes. 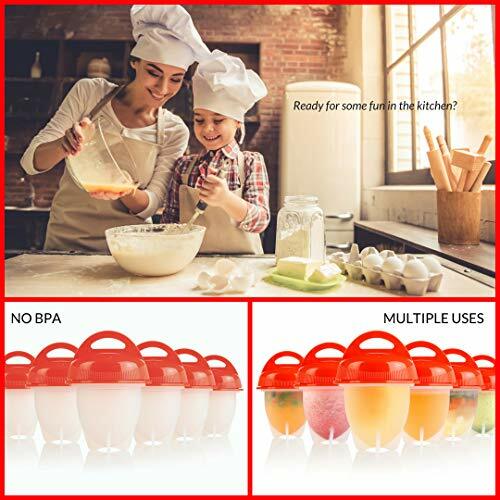 Our silicone egg cooker is made from food safe and non toxic materials that contain no BPA, and it's top rack dishwasher safe. We've upgraded the design of our cooker to include only one vent hole to prevent water from getting in and improved safety threads to keep lids on during boiling. Customer satisfaction is important to us, which is why we offer a 30 day satisfaction guarantee on our cooker. 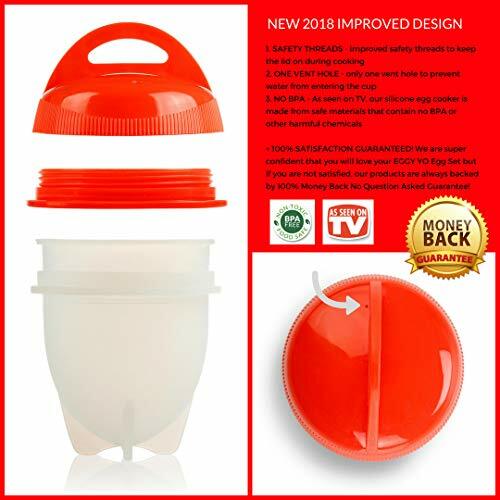 If you have any questions about this product by EGGY YO, contact us by completing and submitting the form below. If you are looking for a specif part number, please include it with your message.